The cakes were a little too moist, I was really rushed, I was lazy with the second tier and just free-handed the lines (a mistake I'll never make again) and to top it off, the top tier actually slipped sideways during the travel to the venue! Boo hoo! BUT, no one said anything negative so I have to assume that, either, they're too nice to say anything or that they were genuinely impressed! The cake was made entirely gluten free (as was most of the dessert table, to meet my mum's food requirements). The top two tiers were made using Healthy Food Guide's Gluten Free Chocolate Cake and the bottom tier was a delicious recipe from Julie Le Clerc, White Chocolate Caramel Cake. I used buttercream with all of the cakes then covered them in fondant. 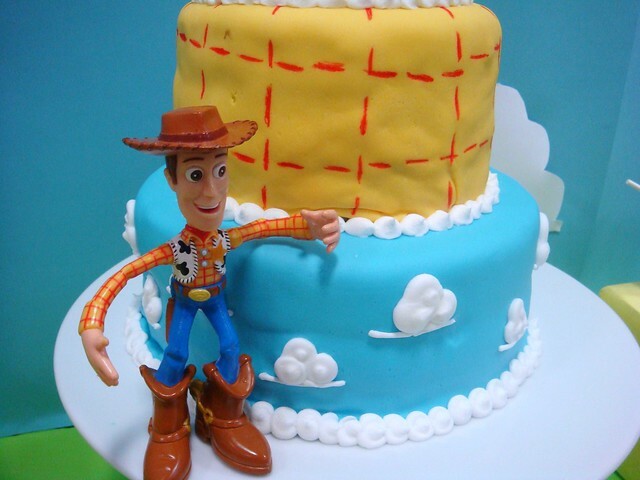 The bottom tier was made to look like the wall paper in Andy's room, the notorious clouds from Pixar. To achieve this look I piped a thin line then added blobs in royal icing. I could have used white fondant but I actually liked the way this gave the clouds a kind of 3D look to them. The middle tier was supposed to be like Woody's shirt, only I should have properly measured where I was going to put the lines. I was in such a rush I didn't think I had time, now I look back and think, who cares if you don't have time, do it anyway! Ahh well, you live and you learn. The lines were made using an edible red marker. You could also paint the lines on using red food colouring gel. 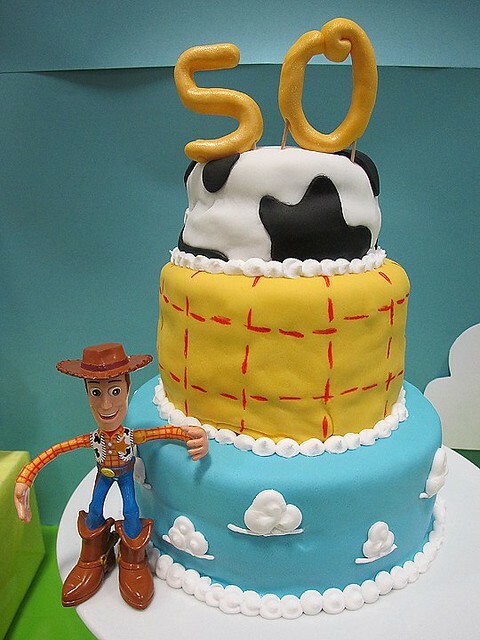 The top tier was to match Woody's vest, once again this one failed me miserably. It actually didn't look too bad until I drove to the venue, where I found that it had moved considerably in the car. The number on top of the cake was made using gumpaste, which I later painted with gold lustre dust. It was quite tricky to get it to sit up nicely and kept falling over. Next time I would probably put some fondant underneath the numbers to help stabilise them. So that is it for the cake. 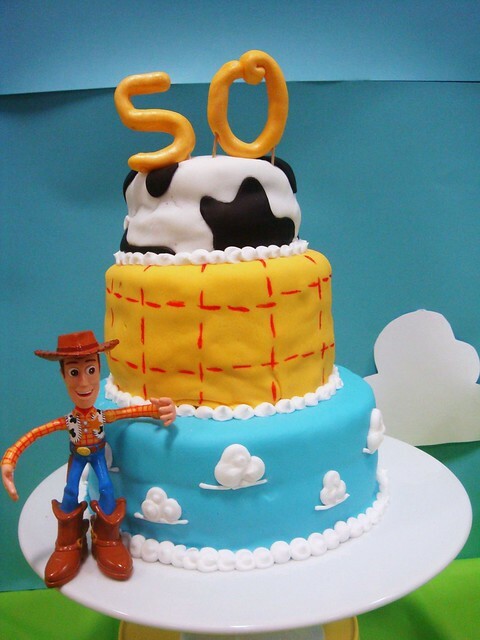 My main tips to other people trying to create a fun Toy Story cake like this one would be to try recipes and techniques before the actual event. But at the end of the day, it's all about how it tastes and this cake tasted great!